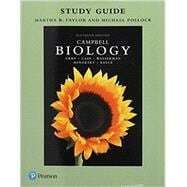 This popular study aid supports Campbell Biology, 11th Edition, and is designed to help structure and organize your developing knowledge of biology and create personal understanding of the topics covered in the text. While allowing for your unique approach and focusing on the enjoyment of learning, the guide also shares a list of common strategies used by successful students as revealed through educational research. The Student Study Guide provides concept maps, chapter summaries, word roots, and a variety of interactive activities including multiple-choice, short-answer essay, art labeling, and graph-interpretation questions. Key Concepts are included to reinforce the textbook chapter’s big ideas. Framework sections helps the student form an overall picture of the material presented in each chapter while Chapter Reviews synthesize all the major biological concepts presented in Campbell BIOLOGY, 11th Edition. Structure Your Knowledge sections ask you to link concepts by completing concept maps, filling in tables, labeling diagrams, and writing essays. Test Your Knowledge sections help you prepare thoroughly for exams. A complete Answer Section provides answers to all the study guide activities. Michael Pollock is a retired biology instructor who earned his BSc (Hon Genetics) and PhD (Zoology) at Western University (previously known as the University of Western Ontario). During more than 25 years of teaching at Mount Royal University, he developed and taught many courses including non-majors biology, vertebrate zoology, reproductive biology, evolutionary medicine and medical terminology. Martha R. Taylor has been teaching biology for more than 35 years. She earned her B.A. in Biology from Gettysburg College and her M.S. and Ph.D. in Science Education from Cornell University. She has taught introductory biology for both majors and non-majors at Cornell for many years and was most recently a lecturer for the Learning Strategies Center. Based on her experience in working with students from high school and community college through the university level, in classrooms, laboratories and tutorials, Dr. Taylor is committed to helping students create their own knowledge of and appreciation for biology. In addition to her work on the study guide, she is a coauthor on Campbell Biology: Concepts & Connections.